Park Lane is a popular and well established primary school situated in Tilehurst, Reading. The school operates on two main sites: the infant site found next to Tilehurst Library and the junior site further along the road after the Triangle shops. Park Lane is a large primary school (with numbers rising up to 420) and is well attended by children in the area. 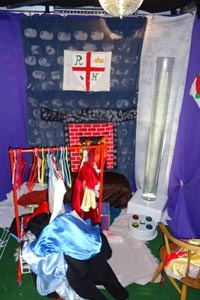 The Phyzzpod has been themed many times by staff at the school, with children helping to make props. In the picture you can see the Pod setup as a castle, with fireplace (making use of the fire projector) and a heraldic coat of arms.